Can design be a catalyst for community-driven change in cities? We think it can, and with the support of a Knight Foundation grant, 8 of the TransDesign students were chosen as part of a cohort of 12 graduate fellows from the School of Design Strategies at Parsons to work in collaboration with design professionals from the global design firm IDEO and two teams of civic innovators from cities that Knight invests in to create an Urban Prototyping Lab to explore ways to use the tools of design to strengthen community identity and resilience. Fellows worked with a team of instructors from IDEO t to explore ideas through rapid prototypes. 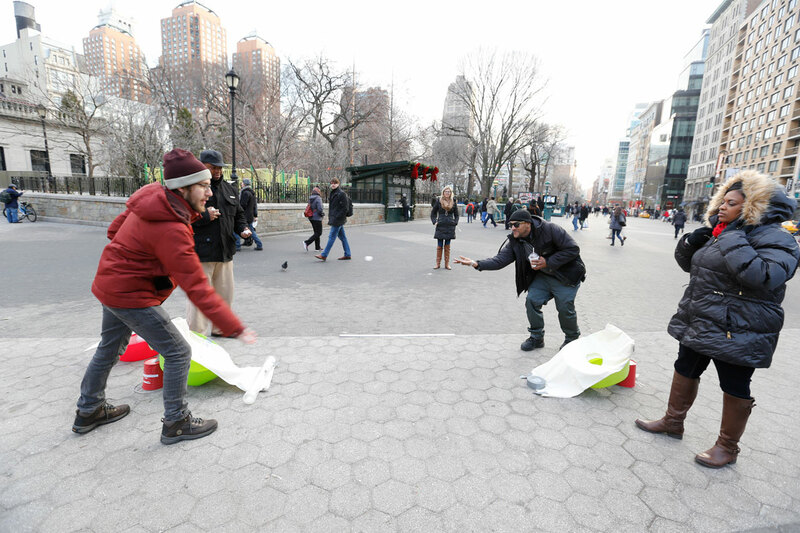 Full scale prototypes were tested by in the public realm before visiting the host cities. How do you turn a big idea into a successful outcome? Both Parsons and IDEO believe that means including more voices into the process and inviting all hands on deck to make the change that people want to see. This inclusive approach, which IDEO calls human centered design, utilizes the methods of design to stress-test big ideas, generate bold new visions, involve a diversity of perspectives, quickly model alternatives, and generate prototypes that solicit effective feedback from end-users about the process. Most importantly, this iterative process leverages the ideas, energy and participation of the stakeholders themselves, leading to solutions that are more tightly knit into the fabric of the community. To test out this approach for urban challenges, three instructors from the design and innovation consultancy IDEO—Eleanor Morgan, Njoki Gitahi, and Lawrence Abrahamson—created a two-week long “Cities In Learning” bootcamp to share their experience and know-how in civic prototyping. Combining playful exercises with rigorous research, the first week of the bootcamp provided a deep dive into IDEO’s user-centered design methods. The instructors challenged the Parsons fellows to think fast and iterate faster, generating actionable ideas in minutes. In between design sprints, fellows were tasked with collecting information about and identifying opportunities for the two cities that they would eventually be working in, Detroit, Michigan and Charlotte, North Carolina. Student fellows reached out to subject matter experts, community leaders, and design professionals to inform the direction that the concepts may take. The civic innovators from Detroit and Charlotte joined for week two of the bootcamp, bringing with them their big ideas and fresh energy. 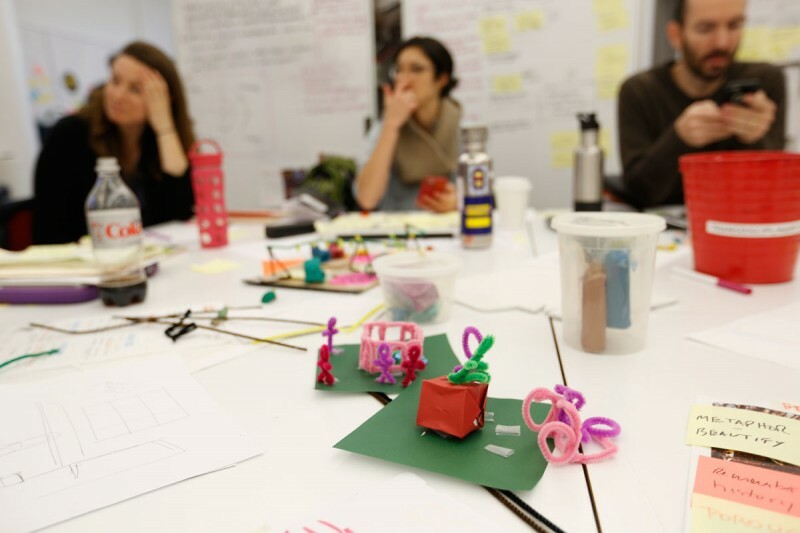 In a series of structured, team-building encounters, the IDEO instructors and Parsons fellows worked side by side with the civic innovators to turn their community visions into feasible, testable, and implementable projects. For the Charlotte team, that meant developing a lighting-based social “magnet” to install in a key park that divides two very different communities in the city. For Detroit, the team is prototyping two initial ideas: a “launch box” and an interactive story map. The launch box will introduce new rehabbers to the process of building rehabilitation. The story map will gather information about building projects happening around the city to share tips and tricks across neighborhoods. Exhausted and exhilarated after their week together, the civic innovators from Detroit and Charlotte headed back to their hometowns, but the work isn’t finished. The IDEO designers and Parsons fellows will be traveling to Charlotte and Detroit this month to execute full-scale prototypes as a means to galvanize community members and stakeholders, generating further user insights, feedback, and commitment.